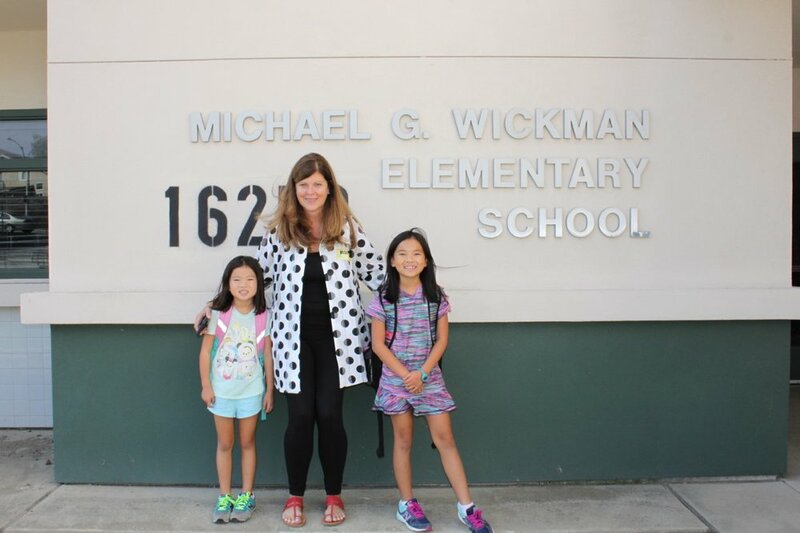 Had a great time at the Montessori Co-op School's Week Long Residency. Thank you! 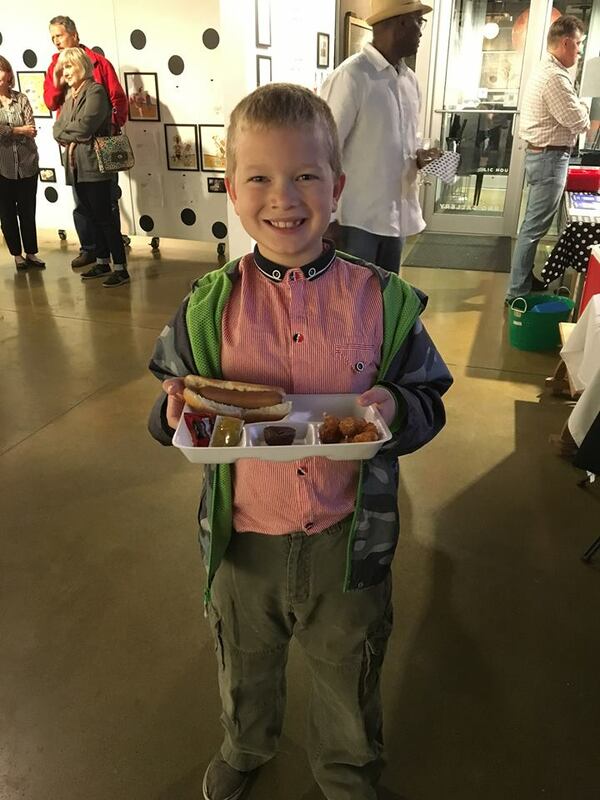 Had lots of fun selling Ethan Eats Hot Lunch at the Made with Love Market. Thanks to Fran, Allison, and Ruby for their help. Thank you to Kathy Kozak for inviting me to spend the day with the K-5th grade students at Reeder Elementary. 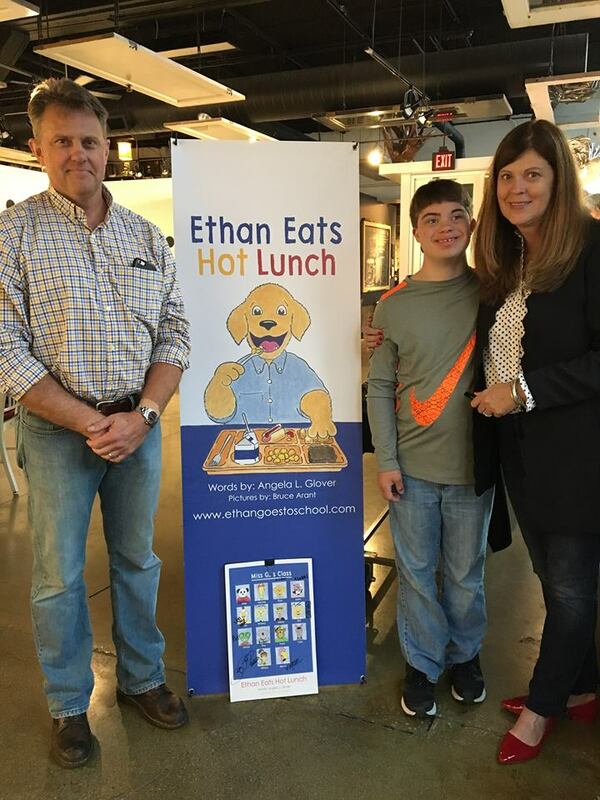 It never gets old hearing where Ethan Eats Hot Lunch has landed. 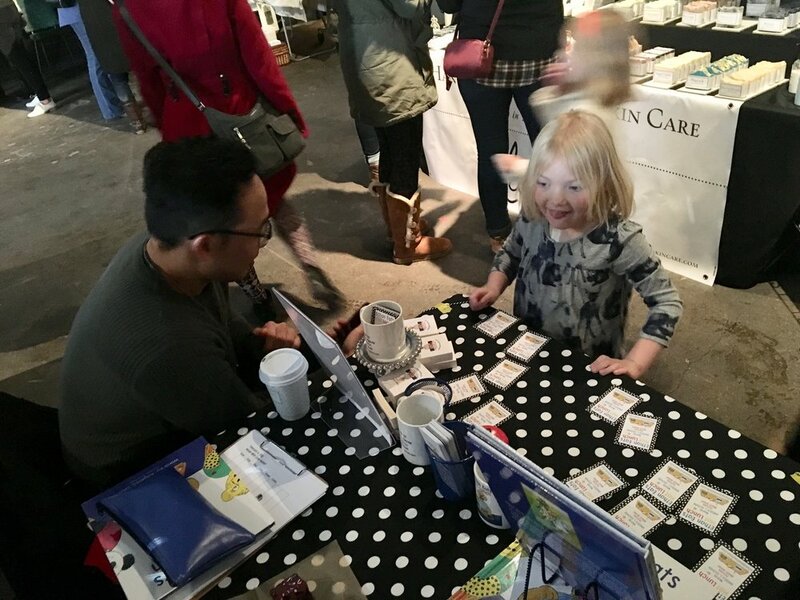 Thanks for sharing, Montessori Parents Co op. So happy to be listed in your library's system. Lots of fun, and folks, at the Aksarben Holiday Mart. 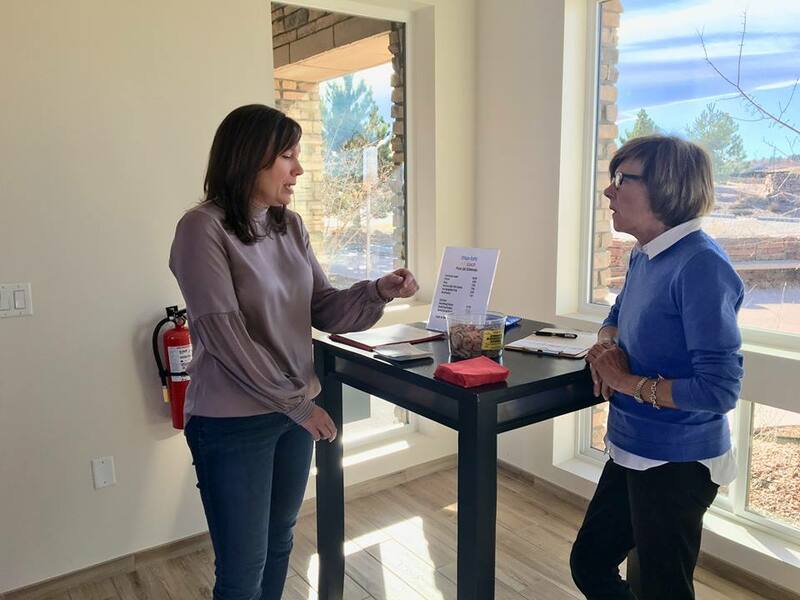 Thanks for inviting me Concierge Marketing. Had a great time reading at Barnes and Noble, Oakview, Omaha, NE. Thanks for having me. 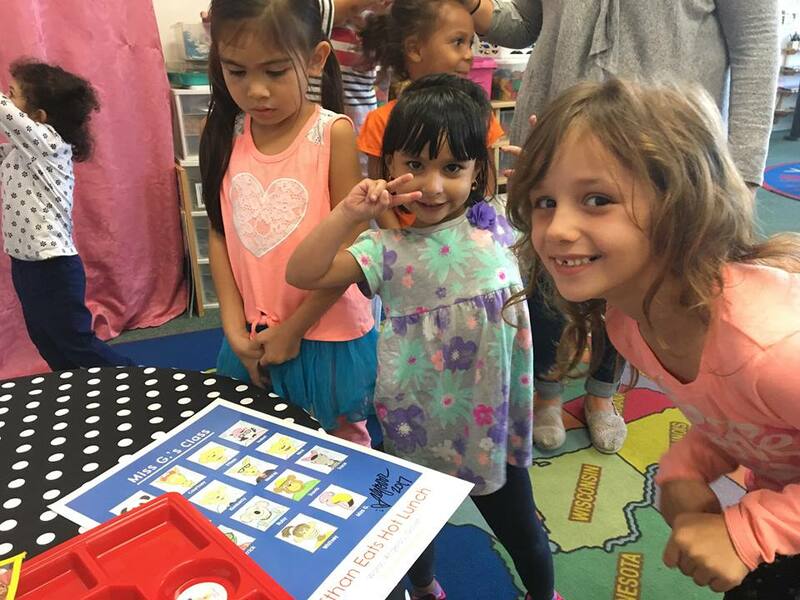 What fun it was to share Ethan Eats Hot Lunch with the Kindergarteners at Independence Elementary in Aurora, Colorado. Thanks, Miss Anne. I had a wonderful time talking with Warrior Students about gratitude at West Ridge Academy in Greeley, Colorado. Thanks Abbo family. Had a great time talking to Sigma Tau Delta students about writing and publishing. 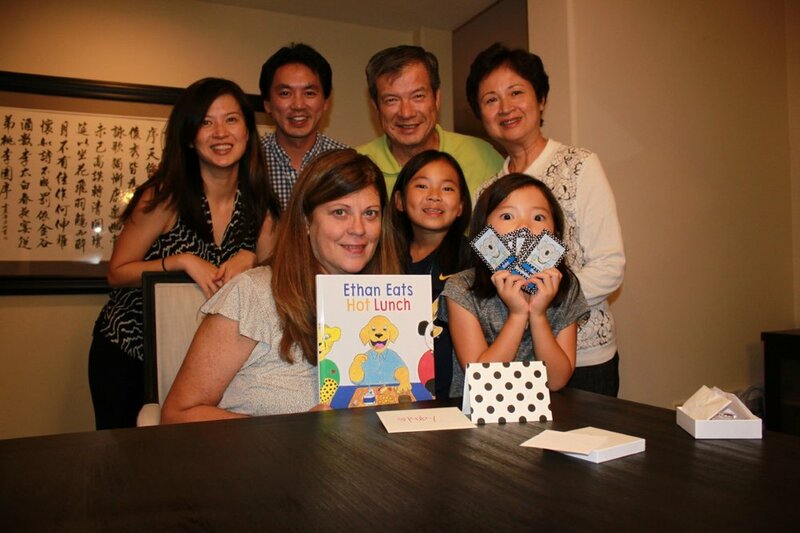 What fun it was to have family and long-time friends in the audience while sharing Ethan Eats Hot Lunch. 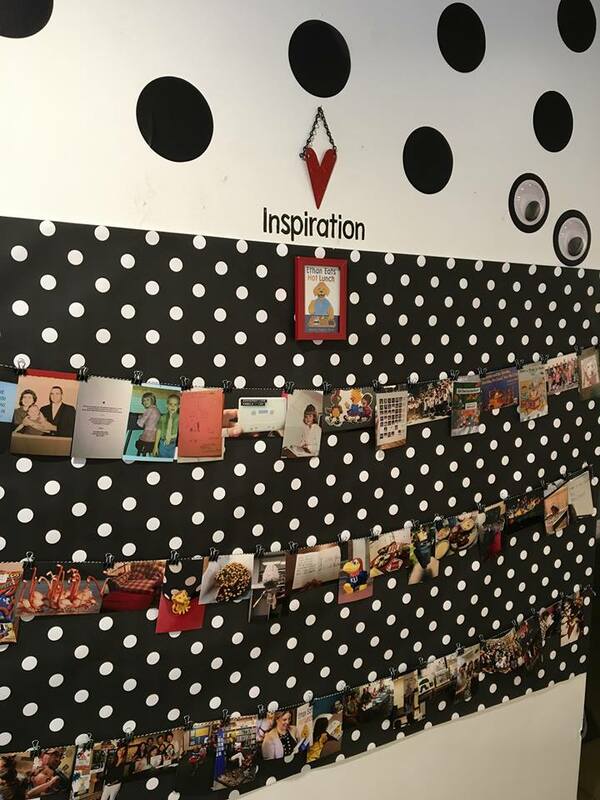 "When Words Meet Pictures: How THIS Book Was Made," the pop-up exhibit at Dixie Quicks was a huge success. 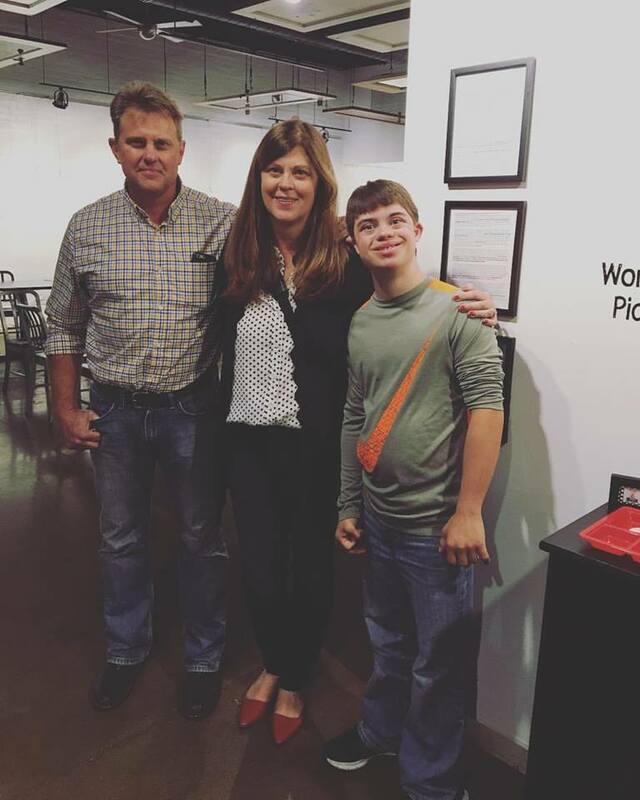 Thanks to all who came down to meet Ethan and view the exhibit. The show has been extended to Thursday, Oct. 26, so stop down and take a look, buy a book, and then go eat at Dixie Quicks. Travis the bear, Patrick the chameleon, Ethan the yellow lab and his dad Lee, also a yellow lab were in attendance. The lunch was delicious, thanks to Rob and Juan, and the folks at Dixie Quicks along with those who attended. 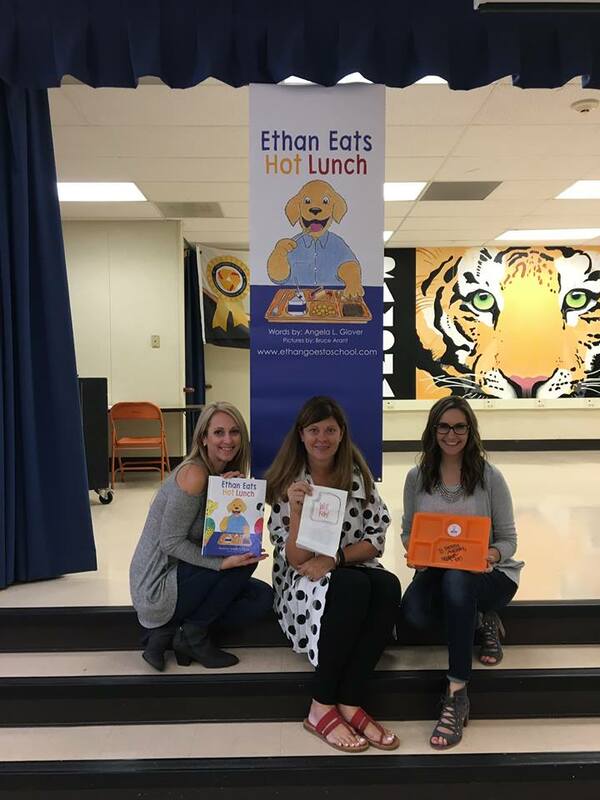 I had a wonderful time sharing Ethan Eats Hot Lunch and the revision workshop with the third and fifth grade students at former student Kimberly Smith's school. Thanks for inviting me. Happy to be invited back for another visit in 2018. 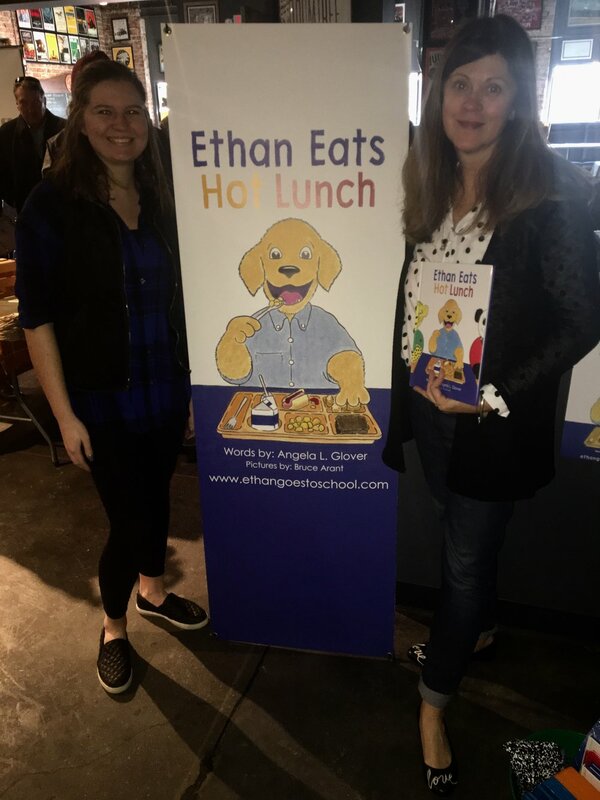 Many thanks to Meena Manakatala, mother of the kangaroo in Ethan Eats Hot Lunch, for inviting me to read to the students of her school. What fun we had using two hands to carry our trays. What fun it was to visit with former student Ruby Shih Chang and her family. 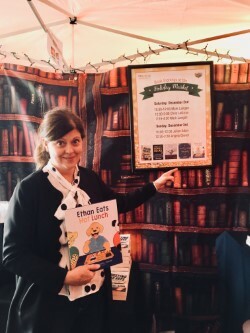 Ruby is the Koala bear in the book and a dear former student from when I taught at Maple Hill Elementary in Diamond Bar, California a long time ago. 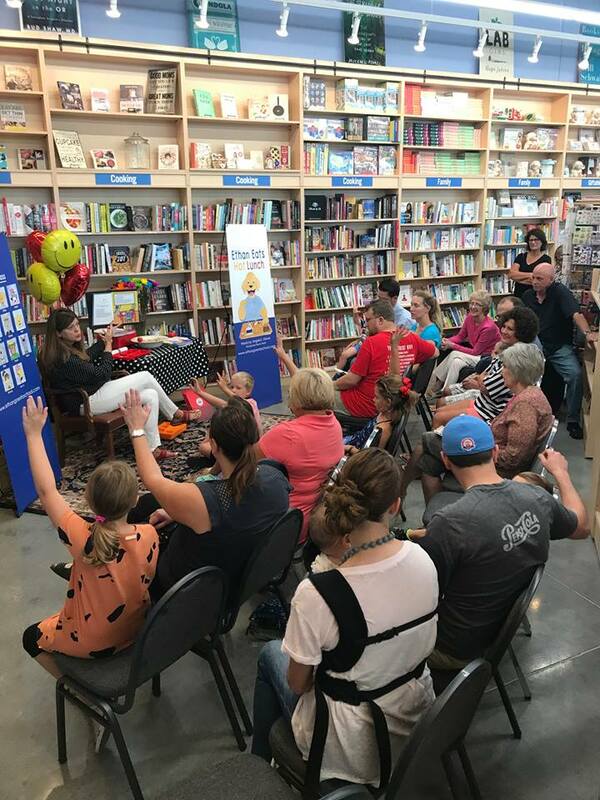 Reading and signing was extra fun as her daughters Emma And Avery were in the crowd and the bonus was visiting with her parents Walter and Grace. It was great to see old colleagues turned friends at Funaro's Deli in indianola. 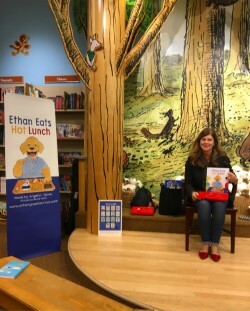 Thanks for coming out to hear Ethan Eats Hot Lunch. 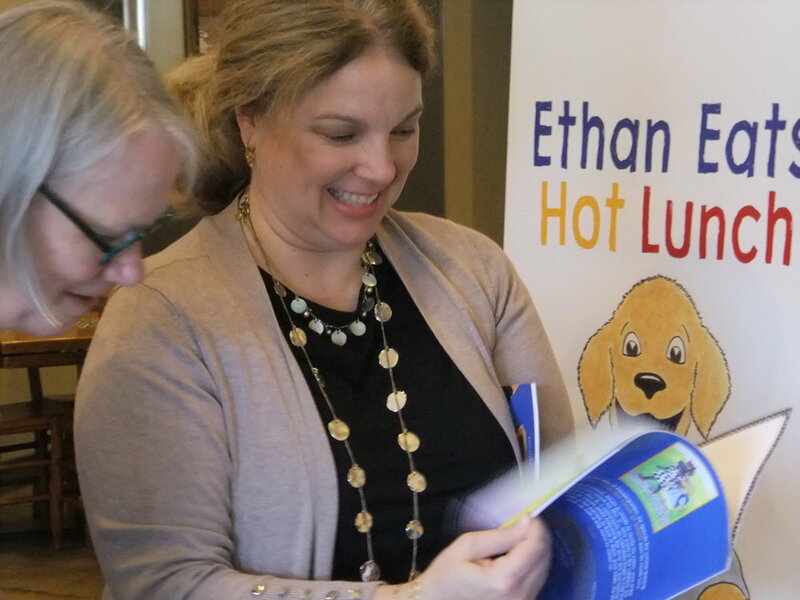 Ethan Eats Hot Lunch was released in paperback at a party for friends and family that featured the hot lunch served in the book. 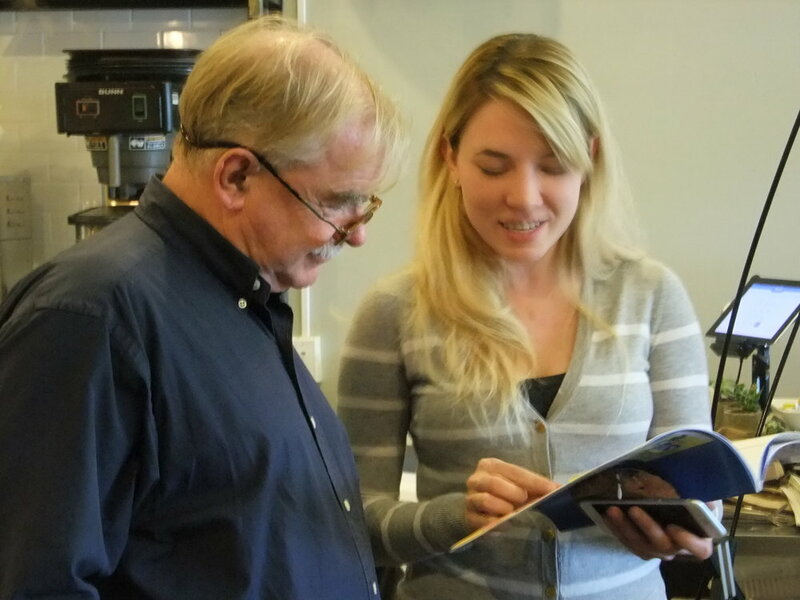 Guests dined on hotdogs, tater tots, peaches, and brownies before listening to a reading of the story to the 70 some attendees. Characters from the book joined Glover and Arant for autographs, which concluded the evening. 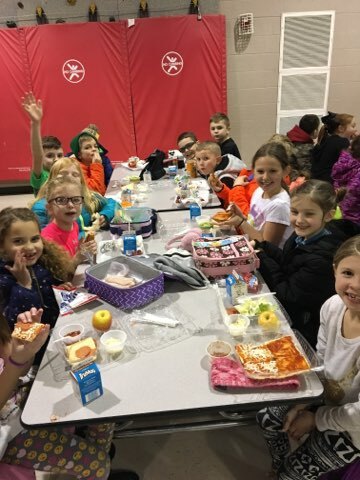 Kids young and old shared memories of eating lunch at school. Characters from the book signing autographs. 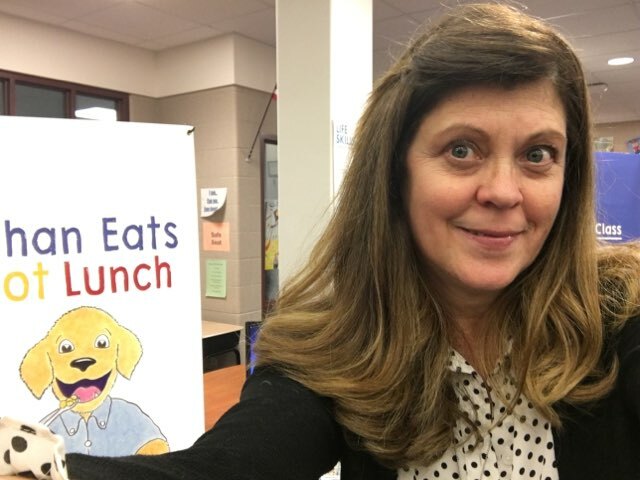 Saturday, August 26 / 11 a.m. | Author Angela Glover and illustrator Bruce Arant will sign their new book, Ethan Eats Hot Lunch. 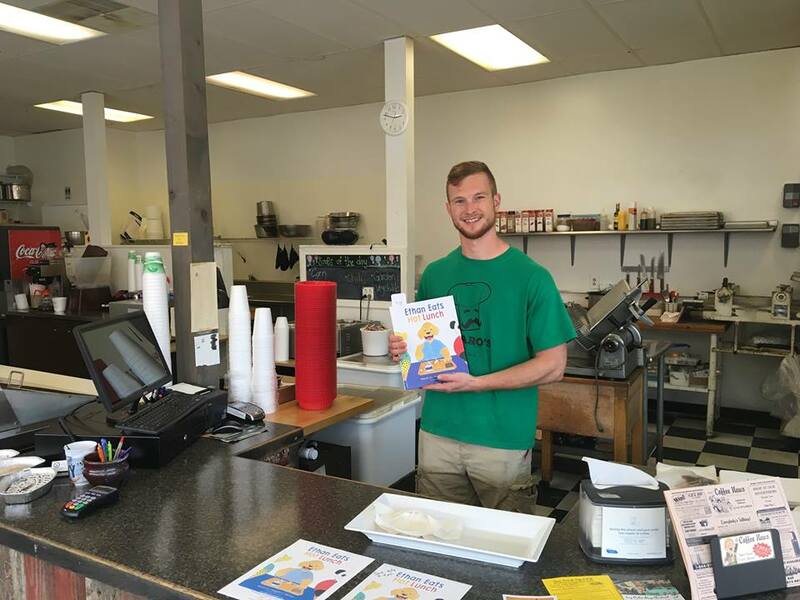 Meet Ethan, Lucy, and characters from the book while enjoying a hot lunch snack. 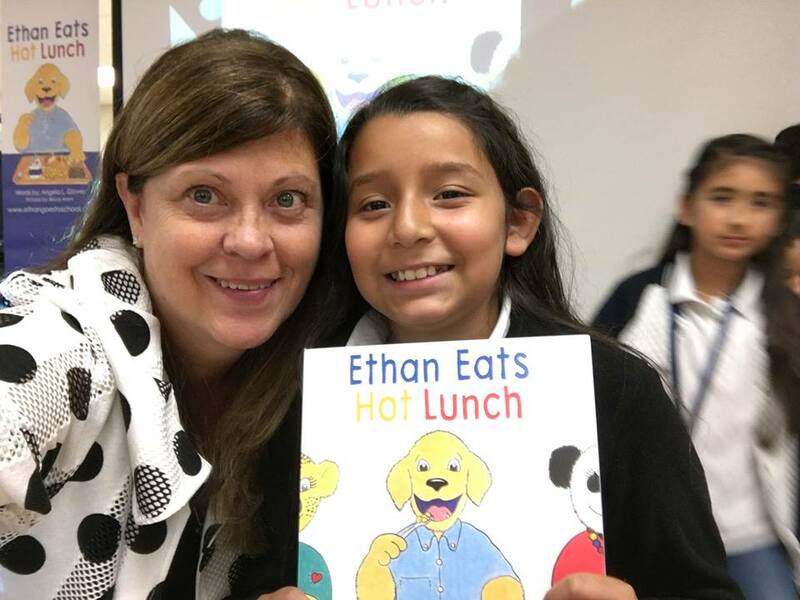 Before Ethan’s first day of Kindergarten, he spends the summer learning the rules for how to eat hot lunch at school from his cousin Lucy. 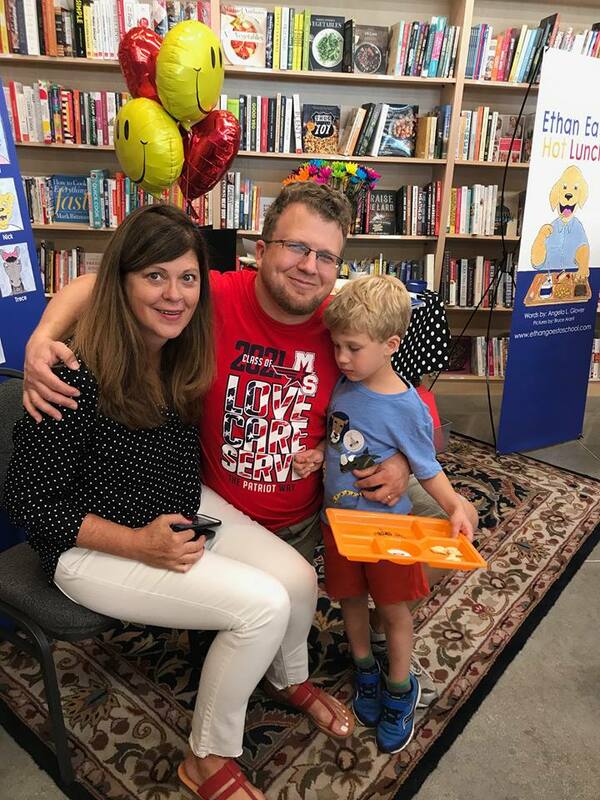 On the first day of school, Ethan is ready to recite his colors, most of the numbers, and his last name for Mrs. C., who works in the cafeteria. When the students in Miss G.’s classroom accidentally forget to hold their lunch trays with both hands while following the silver line and looking at the back of the head of the person in front of them, poor Eddie, the janitor, ends up with a big mess to clean up. 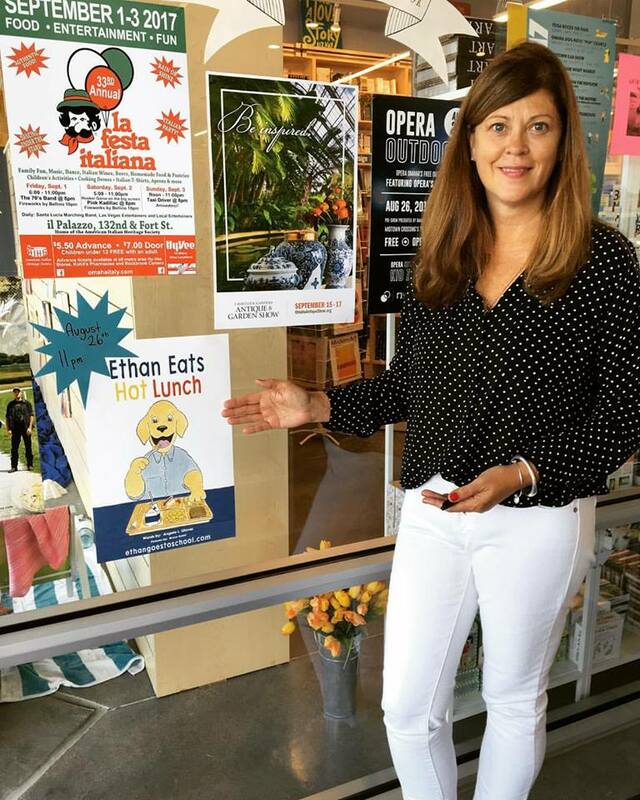 Thanks for inviting me to share Ethan Eats Hot Lunch on your first day of school! 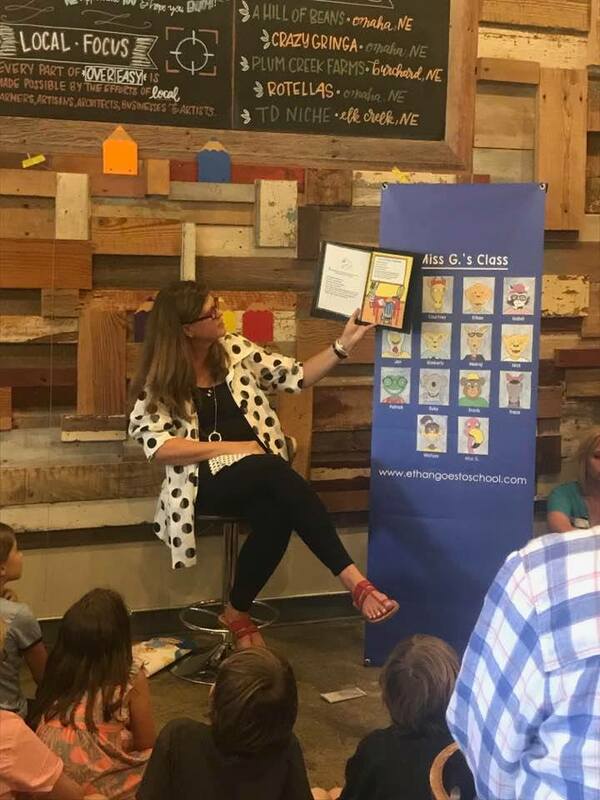 What fun I had with Kindergarten, First, and Second grade students at the home of the drinking fountain featured in the book. I hope the trip down the silver line lead you to a delicious lunch. 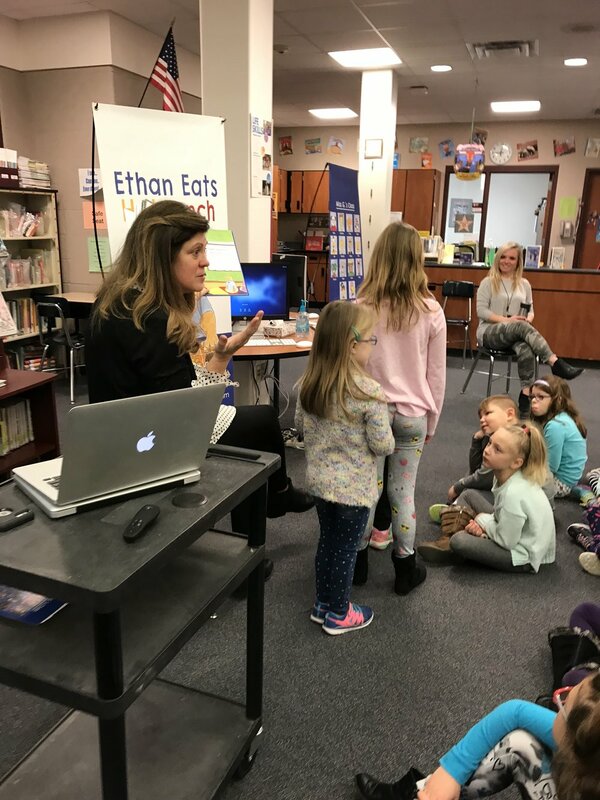 Thanks for inviting me to share Ethan Eats Hot Lunch Mrs. Haller and Ms. Waters.